My article, The Plight of Mozart's Eden: Saving the Villa Bertramka, was published on HISTPRES yesterday in honor of the 225th anniversary of the premiere of Don Giovanni which is today. HISTPRES is the premiere online community for young and emerging preservationists. I'd like to extend my sincerest gratitude to their organization, especially Meagan Baco, for giving The Friends of Bertramka a platform in the preservation community, a constituency that will be integral to realizing the success of our cause. Thank you. I've had the unique experience of evolving personally and professionally alongside my affinity for a precious cultural landmark, the Villa Bertramka in Prague. I've visited Bertramka three times to date and every visit has marked my progression from a student and keen enthusiast to a young professional attending a musicology conference. As I gained a comfortable familiarity with its interior, artifacts and gardens, my admiration and understanding of its storied significance flourished. Bertramka is sacred to all who have drawn joy from the music of Mozart. Once a farmhouse surrounded by vineyards, Bertramka was transformed into a refined 18th Century villa with a park and gardens. It was a popular gathering place for artists, nobility and artistically-minded citizens. Concerts were held regularly throughout the summer and and autumn seasons. Welcomed by owners and friends Josefa (a renowned opera singer) and František Dušek (famous composer, teacher and keyboard virtuoso), Mozart stayed there during his visits to Prague in 1787 and 1791. 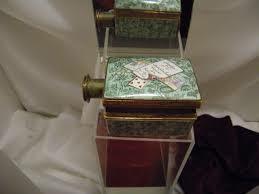 A pair of opera glasses owned by Josefa Dušek, the owner of Bertramka during Mozart's visits. They are exemplary of the precious artifacts that were once displayed in Bertramka's Museum. Photo by Sherry Davis. Mozart's autumnal journey to Prague in 1787 for the premiere of Don Giovanni was particularly an artistic and leisurely oasis from an often difficult life in Vienna where his music was often met with indifference. Mozart completed the overture to Don Giovanni at Bertramka the night before the premiere, which was wildly successful. Prague's populace was one of the most musically educated in Europe, and they were the only public which fully recognized and appreciated Mozart's music during his lifetime. Mozart's visits to Prague have been captured in works of film and literature such as Eduard Mörike’s 1855 novella, Mozart auf der Reise nach Prag (Mozart's Journey to Prague), Mozart-Novelle by Louis Fürnberg in 1947, the Czech serial F.L.Věk in 1971 and more recently the 2005 film by BVA International, Adieu Mozart, which features Bertramka in historical context. This excerpt from the film showcases Bertramka's beauty and remarkable history with one of the world's greatest musical minds. Bertramka remained in its original state until a fire emerged from an outbuilding resulting in extensive damage to the villa on December 31, 1873. The outbuilding was destroyed as well as Bertramka's shingle roof. Miraculously, Mozart's study and its beautifully ornate beamed ceilings were untouched. The renovation work undertaken by owner Adolf Popelka unfortunately reflected a 19th Century aesthetic and although there were attempts in the following decades to restore it to its original state before the fire, it has never been fully achieved. The industrial revolution also changed the landscape surrounding Bertramka, and now only the original wall contains remnants of the former estate once known to Mozart. The Czech Mozart Society purchased Bertramka from the Mozarteum in 1929 and had begun restoration efforts, concerts and exhibitions, but this ended with the Nazi occupation and subsequent Communist rule. They were pressured to turn over Bertramka to the State and they did so in 1986, but they applied for restitution a few years later after the Communist regime collapsed. During the lengthy litigation process, Bertramka was rented, operated and maintained by Comenius (the Pan-European Society for Culture, Education, and Scientific and Technical Cooperation). In 2009, the Court finally ruled in favor of the Czech Mozart Society after 18 years of litigation. 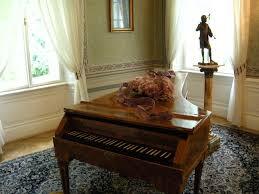 A room in Bertramka displayed a fortepiano believed to have been played by Mozart. Photo by Sherry Davis. I attended the joint conference of the Mozart Society of America (MSA) and the Society for Eighteenth-Century Music (SECM) in Prague. Organized by Dr. Kathryn Libin, the President of the MSA, Mozart in Prague was the first international conference of its kind devoted to the subject of Mozart's relationship with Bohemia. During our dinner and concert at Bertramka, the excitement was tangible concerning the property's restitution to the Czech Mozart Society. It was to be a significant triumph and celebration for Bertramka's rightful guardians, but the news we received of this occasion just months later could not have been farther from joyous. See photos on page 1 and page 2. Bertramka was unrecognizable. All of the major fixtures in the bathroom and kitchen along with all other electrical and lighting fixtures and furniture had been removed with great recklessness. The previous tenant had taken most of these items, and although it’s unknown as to who was responsible for extricating all of the artifacts, instruments and portraits from the museum, the Municipality of Prague 5, the Czech Museum of Music and the former tenant are strongly implied. Some of these items are now in the National Museum and the Czech Museum of Music is also claiming ownership of Bertramka’s treasures. It’s difficult to trace this ownership back as many of the people who would have remembered are now gone. Old politics and alliances have come into play. There will inevitably be another round of litigation over the ownership and restitution of these exhibition items. Watch a tour video of the museum prior to the restitution incident. In addition to losing everything in the museum, the Czech Mozart Society also lost the majority of their archival records. While Bertramka was being rented by Comenius, they did not have access to their archives for the past seven years, which were stored in an outbuilding. When they opened it in 2009 during the restitution, they found that their documents and chronicles had been strewn everywhere and the building had been inhabited by martens. Their archives had been virtually destroyed. “When they could not in the end stop the Court Decision that Bertramka must be returned to the Mozart Society, then “they” were only about one thing – to plunder it, damage it, in order that Bertramka could not serve for a long time as an important cultural monument of Prague. And they might even be successful in this, because we have been able to restore only the concert room at present,” said Dr. Tomislav Volek, President of the Czech Mozart Society, in the Czech TV segment, On The Restitution of Bertramka. In response to the incident, Dr. Libin founded the Friends of Bertramka, an organization devoted to working with the Czech Mozart Society to restore the property, its museum, concerts and initiatives. In summer 2012, Dr. Libin visited Bertramka to donate the funds thus far collected to Dr. Volek. She reported to me that Bertramka was not in good condition as the Society had not been able to afford even basic maintenance. The villa had endured a few difficult winters since 2009 and parts of the facade were crumbling. The garden was also in a state of disrepair. Dr. Libin and Dr. Volek at Bertramka in Summer 2012. Photo by Milada Jonášová. In terms of fundraising, there isn’t a specific goal amount for Friends of Bertramka. It’s more or less a rolling total as we approach the restoration phase by phase, but Dr. Libin expects that we’ll move into a more goal-oriented phase at a certain point. She hopes to create a fundraising event in New York next year to coincide with the MSA meeting. In the meantime, the most important action on our agenda is to facilitate awareness among professionals and general enthusiasts in preservation and cultural communities. All are welcome to join us as we move towards a promising future for this beloved Mozart landmark. It will be a difficult undertaking to restore the former beauty of Mozart’s Eden that was so heartlessly devastated, but with perseverance and affectionate dedication, success shall be ours. Sherry Davis began her authorship of The Chronicles of a Modern-Day Mozartian as an avenue to re-imagine the manner in which the life and music of Wolfgang Amadé Mozart is communicated, shared and defined. By enhancing the history through a change in presentation to create accessibility, excitement and relevance in the contemporary, her platform connects audiences to Mozart through engaging narrative, historical insight and playful banter. From managing a theatrical release to scripting a television program, developing an app for mobile devices and dedicating her efforts to the restoration of an historic landmark, Sherry has become an authority on championing the Mozart name. Pioneering a professional identity as a Preservationist, she creates awareness of the history’s musical, musicological and cultural significance to cultivate sustainability through appreciation and patronage. Her work is respected and consulted by music educators, arts professionals and general enthusiasts. From scholarship to popular culture, Sherry brings Mozart into perspective via the 18th Century, the latest, and everything in between.